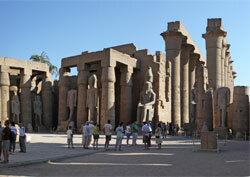 The Temple of Karnak in Luxor was the spiritual center of the Egyptians. It is enormous - the world's three largest cathedrals combined would fit into it. It took millennia to build and enhance the massive Karnak Temple. However, most of the work on Karnak Temple was done by the pharaohs of the New Kingdom (1570-1100 BC). The Great Hypostyle room is larger than a football field and is easily one of the grandest spaces ever erected. The Great Hypostyle's forest of 134 rocket-size columns (many still stand) dwarf Karnak Temple visitors. These columns once supported a high stone-slab roof that kept light out, creating a darkish ambiance that added to the mystique of the ceremonial processions of pharaohs and high priests. The Second Pylon served as a pageantry gate leading to the Great Hypostyle Hall (see photo) - and as a barricade to unauthorized mortals (only the elite could enter).